You just never know what you're gonna find at a garage sale or thrift shop! Many of you are amazed at my finds. The key to finding great stuff is persistence. 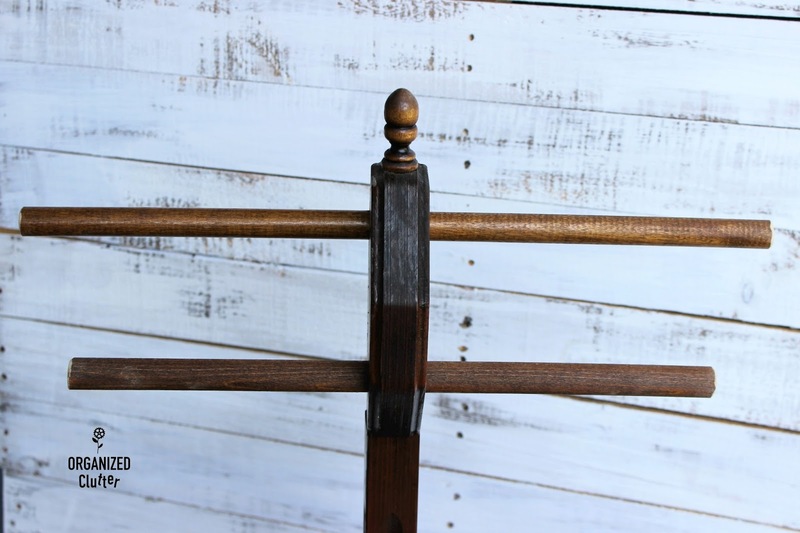 If you go thrifting or garage sale-ing infrequently, your chances of finding something unusual are about nil. I stop at our two local thrift shops almost every lunch hour, and when I attend garage sales, I am one of first attendees. That all being said, the above, was a recent yard sale purchase. I paid $10 for this bathroom towel holder. My first thought was that it was an antique, but now I think it's a homemade item. But still a pretty cool find. I had no intention of putting it in the bathroom for towels, but I thought it would make a great display piece for some of my vintage linens. 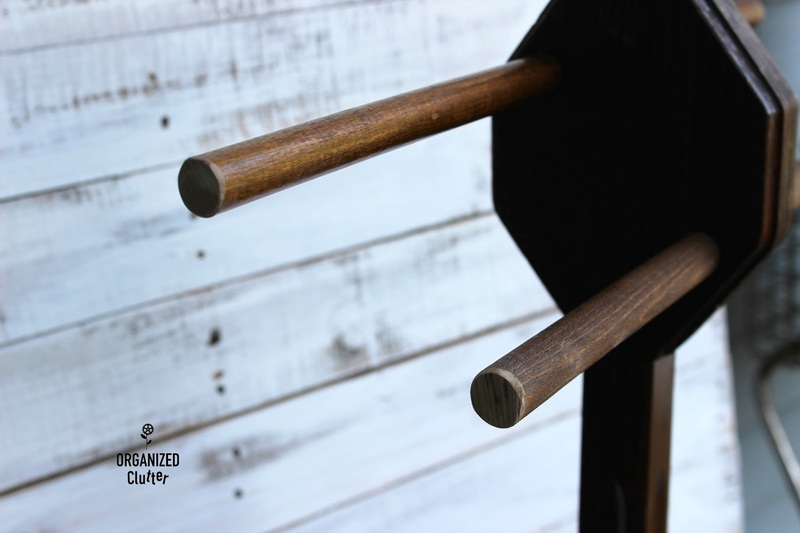 I cut the dowels down, and darkened the ends with Varathane Touch-Up Marker for Dark Walnut . As you can see, I cut the front dowel shorter and the back one longer. I think it's perfect for linens. Now I just need to figure out where to put it! Bedroom or living room. Paint it or leave it. What do YOU think? Stain markers are great for scratch touch up or crafts! Great way to display some pretty linens. I could see it painted for sure! Super cool - I've not seen anything like that. 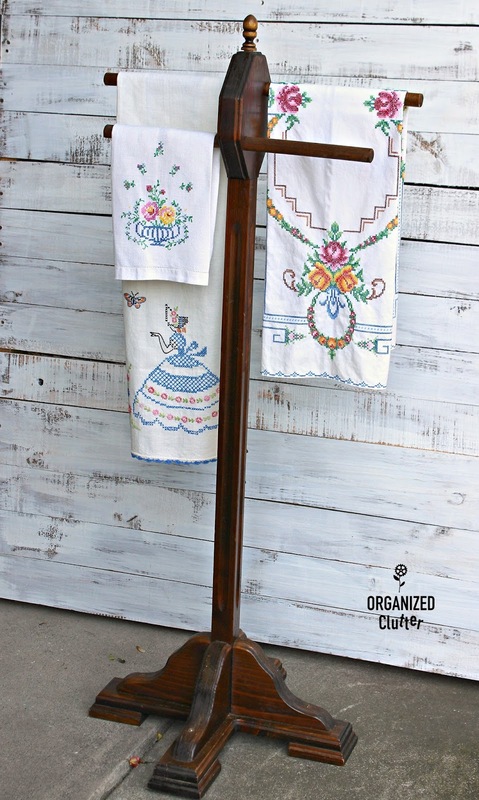 Great idea using it to display the vintage linens. Great idea! 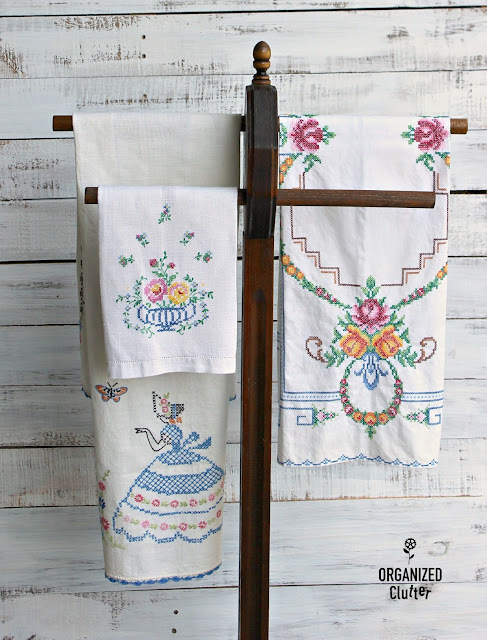 Love old linens, now you have a great way to display them. I think bedroom, painted and distressed. Beautiful anyway! That is a great looking display! The linens look so pretty on it. If you're going to paint it, don't choose white, because your linens won't show up. That's a nice find. Great display piece. Your linens look lovely on it. No paint! You could display bigger pieces, quilts, table cloths leaving it at this height. Fun piece.